My Mother and Father taught me to love the world around me… and if I can help others to see with new eyes and find joy by showing that beauty through photography. I have accomplished my hearts goal. 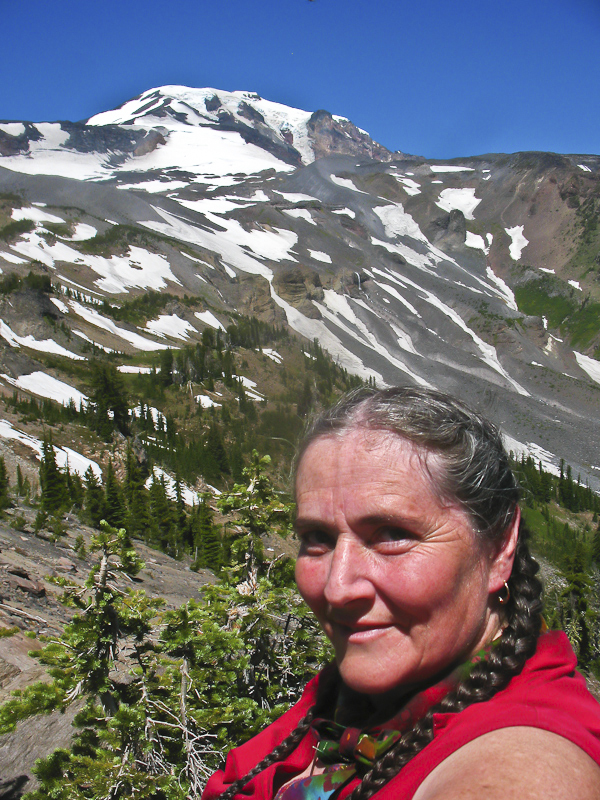 Husum, WA is my childhood home and I consider home to be anywhere from Mount Adams to the Columbia River. I give thanks to my parents for their love for Nature and God, and for the years we spent immersed in nature as i grew up in this paradise. 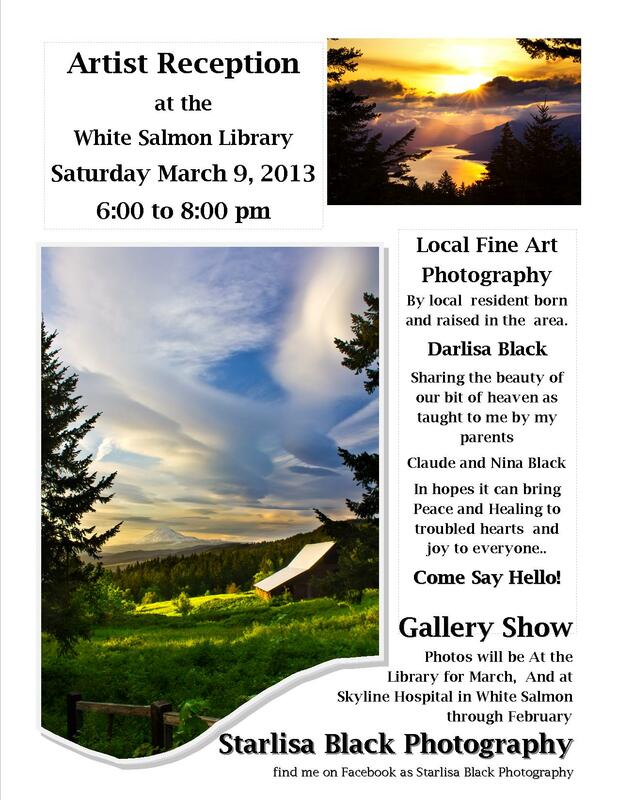 March 2013 will be a showing in the White Salmon Library with an Artist Reception March 9, 6-8 pm. Photo notecards can be purchased locally at Artisan’s Jewelry and Gallery, in White Salmon; and in Heavenly Grounds in Trout Lake; as well as The Hood River Hotel gift shop. In the summer I can often be found at the Trout Lake Saturday market with my new photo books, calendars, cards and prints. 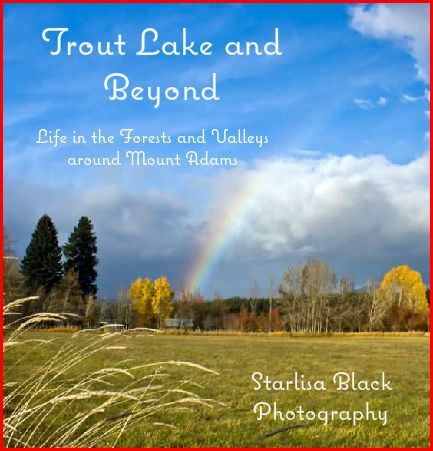 Here is another link for a PDF brochure about Trout Lake, in Klickitat County, WA. IN THE SIDEBAR ON THIS PAGE are links to all my photo sharing sites such as Facebook, Flickr, and Google+ as well as my other blog “In Search of Life’s Beauty”. Keeping up with this modern age of social media and such has finally pushed me into the modern age and I can now take debit and credit cards with my iPhone, as well as Paypal, cash and checks… got it covered! I do not yet have an internet storefront however. Most of my images are available as prints of many sizes, as well as Metal Prints, Thin Wraps, Canvas Gallery Wraps of most sizes. 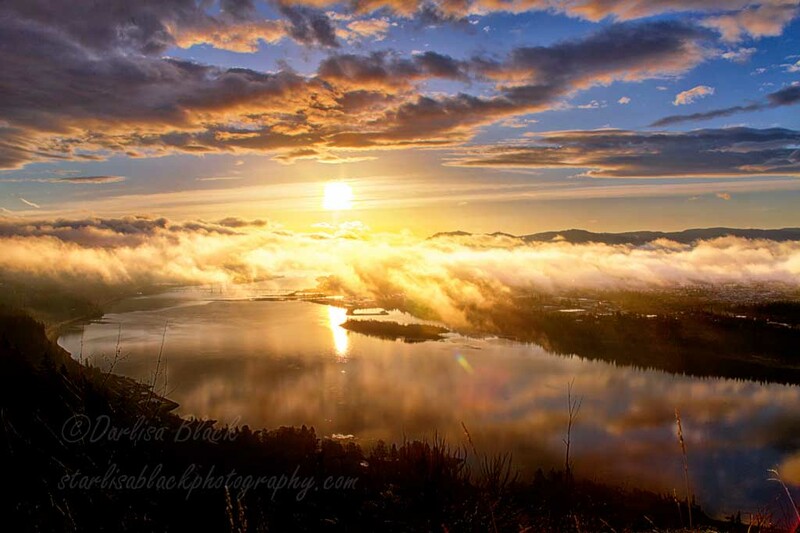 at Grounds Espresso and North Shore Cafe, and The Inn of the White Salmon, and North Shore Clinic in White Salmon, Washington; Three finalist images in the Chasing the Light Show in the Columbia Art Gallery in Hood River, Oregon in August 2012. 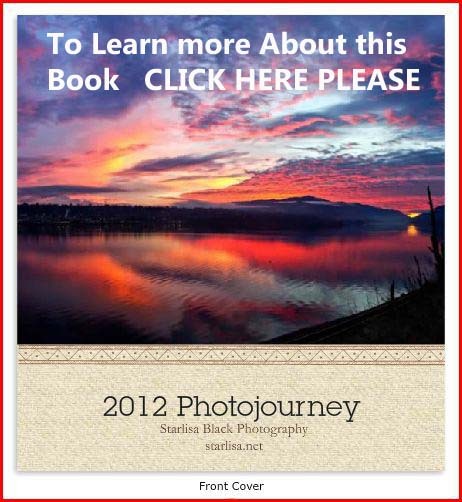 December 2012 and January 2013 was a photo exhibit at Solstice Wood Fired Cafe in Bingen, WA. “Weather of the Pacific Northwest” by Cliff Mass, atmospheric scientist at University of Washington, is an excellent weather book for the Northwest, and includes a lenticular image over Mount Adams. On his weather blog, Cliff posted about my work, calling me a “SKY POET”. I liked that! I am particularly fond of Lenticular clouds and have a large collection of images featuring these unusual formations, and am known on Flickr as the Queen of Lenticulars! That bit makes me chuckle… as I know I am no queen! But I thank my Flickr and Facebook friends for the encouragement. The Stranger Magazine, Seattle Magazine, and others have published images of mine, and many have been shown on news stations such as KOIN 6 and KPTV 12 over the last three years. On another note… I have two website addresses, starlisa.net currently points to this blog as the website with that name was hacked and I have yet to fix things! Thank you for coming to VISIT!! !